The west coast has officially lost another bowl game and this time it is one of the nicest locations of them all, San Diego. The Poinsettia Bowl which was played at Qualcomm Stadium is no more. The big losers here are actually the Mountain West Conference and the BYU Cougar Marching Band. Since BYU is an independent, they actually signed a contract with the bowl to play there if they were bowl eligible. The contract continued through 2018. Now the band and team will have to find a new destination for post season play. Although, a little diversity is always good. 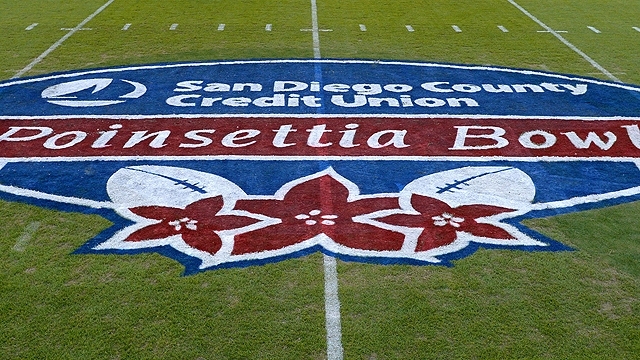 “We were aware today’s announcement from the San Diego County Credit Union Poinsettia Bowl was a possibility,” Mountain West Commissioner Craig Thompson said in a statement. “While we are disappointed by the decision, the Mountain West is thankful for the tremendous relationship we’ve enjoyed with the bowl game." When the bowl first started there were only 28 bowl games each year. Now with over 41 bowl games played each year the over saturation is starting to hit the market hard. San Diego will still have the Holiday Bowl.